The fireflies are gone, although I saw a single, elegiac firefly in the grass a week or two ago. Yet, the symphony by night insects is still going strong. To write about sound is challenging; I may not be up to the task. As a backstop, I listed two excellent audio resources at the end of this post. Nevertheless, here goes . . . Crickets and katydids make most night sounds. You may also hear a frog, toad or mammal making noise in the night. Insects may not be Beethoven, or even hip-hop stars. However, hearing the buzzing, whirring, twirring and croaking is soothing and reminds us that life is lively, even if day lilies, lightning bugs and raspberries have come and gone. 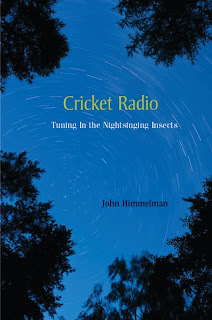 Most of what I now know about night insects, beyond my sense of wonder about night sounds, came from a recent discovery of Tom Ashbrook’s March 16, 2011 interview of John Himmelman, a naturalist who loves the night and wrote the book Cricket Radio: Tuning in the Night-Singing Insects. Although I have not yet read this book, based on the interview it sounds, sorry for the pun, like a great book. Himmelman states “the main reasons night insects sing are to establish - - or challenge - - territories and attract mates.” He goes on to say that sound character is set by temperature; insects are cold-blooded, fertility of each insect and the reaction of insects to each other. Night insects are almost uniformly some of the ugliest of insects. They are not as attractive or streamlined as butterflies or lightning bugs. However, it’s not likely you will see the insects - - and there is nothing like the sounds they make. It’s great to listen to crickets and katydids in a giant natural symphony. However, there are specific voices in the insect symphony, such as Round Tipped Cone-Heads, a kind of katydid that sounds like a live wire and Greater Angle-Wings. The Snow Tree Cricket, or “thermometer cricket;” speeds or slows it call as nights warm or cool. Himmelman explains that if you count the number of chirps in 13 seconds and add forty to it, you get an approximate air temperature. Carolina Ground Crickets are typically the last audible insects. A single Ground Cricket will intrepidly call out as the nights get frosty - - sometimes it finds a refuge and sings into November. Audio resources: On March 16, 2011, on Tom Ashbrook’s program On Point, Ashbrook and Himmelman, play and identify several species of crickets and katydids. 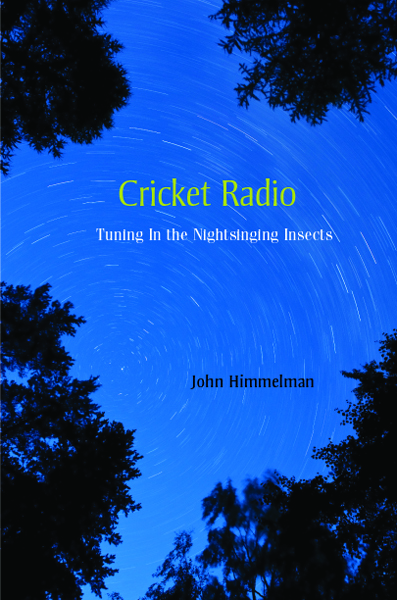 Himmelman has his own website, with the sounds of night insects. At Music of Nature, one can listen to snippets of night insects or buy mp3 downloads of night sounds.